The rate at which the drug is released is called the dissolution rate.When it comes to measuring the release rates of drugs in a manufacturing environment then the technique of Tablet Dissolution testing is employed. Tablet Dissolution is a standardized method for measuring the rate of drug release from a dosage form and the key word here is “standardization” because for any results to be meaningful, it is essential that all the apparatus used for the testing, produces the same sets of results given all other parameters are equal. 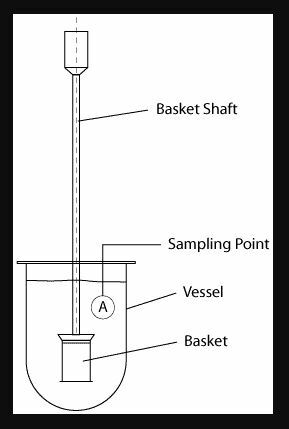 Rotating Basket USP1 is adopted in 1970 the rotating basket method of dissolution testing was the first official method. The apparatus consists of a metallic drive shaft connected to the cylindrical basket. The basket is positioned inside a vessel made of glass or other inert, transparent material. The temperature of the media inside the vessel is kept constant by a water bath or heating jacket. The solution in the vessel is stirred smoothly by the rotating stirring element. The diagram shows a simple graphic of the rotating basket set-up. This is very tightly specified however and the official drawing according to the USP is shown below. The drawing shows a basket manufactured from mesh, connected to a basket hub of with a vent hole by the use of clips. The Basket hub is connected to a rotating shaft. Every parameter of those individual parts is specified. The shafts and baskets must rotate freely and within specified limits, and importantly, they must be accurately centered in the vessel and be free from wobble. The validation of these parameters will be covered in a later chapter. The standard basket consists of a stainless steel 40 mesh construction, but there are many variations depending on the monograph and application. For example, suppository baskets are manufactured from PTFE with vertical slits to facilitate dissolution. Mesh size refers to the number of openings per linear inch and the diameter of the wire used to create the mesh is specified. If the basket is reactive with the dosage form then it can be coated with PTFE or an inert substance such as gold or titanium. The diagram shows that the basket is connected to the rotating shaft by use of clips onto a basket hub. The basket hub also has a specific dimension and importantly, a small vent hole at the top to allow air to escape from the basket should it become trapped. It is important that this hole does not become clogged over time. Some baskets are supplied for use without clips, and use a push-on O-ring instead. While these are excellent for many applications, it is important to show that the results from this design are the same as the results obtained with clips – a process known as equivalence. It is by no means guaranteed that the results will be the same in every case. 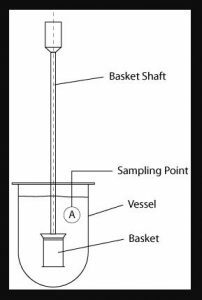 It is also important to note that different dissolution tester manufacturers will manufacture their baskets and hubs to slightly different specifications but all within the USP guidelines. Even though they look similar, baskets are not interchangeable between different tester manufacturers. Note: Apparatus 1- Basket apparatus The assembly consists of the following : • A covered vessel • Transparent material • A motor • A metallic drive shaft, • A cylindrical basket, • The water bath permits the holding of temp inside vessel at 37±0.5 ̊C • The vessel is a cylindrical with hemispherical bottom . The Rotating Paddle, although Method 2, is actually the most widely used method in dissolution testing. 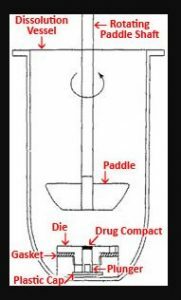 Rotating Paddle, is originally developed by Poole (1969) and was refined by scientists at the FDA for Drug Analysis in St Louis. The specifications for Apparatus 2 are identical with those for Apparatus 1 except that the paddle is substituted for the rotating basket. The paddle apparatus (Apparatus II) consists of a special, coated paddle that minimizes turbulence due to stirring. The paddle is attached vertically to a variable-speed motor that rotates at a controlled 40 speed. The tablet or capsule is placed into the round-bottom dissolution flask, which minimizes turbulence of the dissolution medium. The apparatus is housed in a constant-temperature water hall maintained at 370C, similar to the rotating-basket method. The position and alignment of the paddle are specified in the USP. The paddle method is very sensitive to tilting. Improper alignment may drastically affect the dissolution results with some drug products. The same set of dissolution calibration standards is used to check the equipment before tests are run. The most common operating speed for Apparatus II are 50 rpm for solid oral dosage forms and 25 rpm for suspensions. Apparatus II is generally preferred for tablets. A sinker, such as a few turns of platinum wire. may be used to prevent a capsule or tablet from floating. A sinker may also be used for film coated tablets that stick to the vessel walls or help position the tablet or capsule under the paddle (Gray et al, 2001). The sinker should not alter the dissolution characteristics of the dosage form. The dimensions of the paddle are closely controlled. Any variations can easily have a detrimental effect on reproducibility from vessel to vessel. For this reason, paddles should be treated as a precision piece of equipment, stored correctly, and inspected regularly for scratches, dents or other imperfections. The dissolution test relies on uniform flow patterns and any imperfections can lead to turbulent flow. For that same reason, wobble and other deviations must be tightly controlled with specifications similar to the basket test.